Hey, here's a little post to get us back on track. More soon. First, hi Pittsburghers! 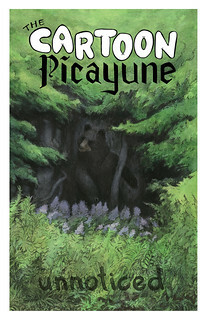 You can now buy The Cartoon Picayune at the Copacetic Comics Company. And here are two things that are not exactly comics journalism as it is in the CP, but they are still non-fiction comics I've drawn recently. First, I did some freelance work with Culture magazine (yes, an artisan cheese magazine), and you can read that story here. Also, I've been working on something on the side called Sequential News. You'll see what it is when you get there. Finally, I've been trying to use twitter a lot more, so follow The Cartoon Picayune if you wish, or "like" us on Facebook. The new issue is really shaping up, more on that soon.